Le Club AccorHotels has launched two separate offers for stays in Cambodia, Laos, Indonesia, Malaysia, Myanmar, Philippines, Singapore, Thailand and Vietnam. One of the offers is for Accor Plus Member-For-A-Stay voucher and the one $20 F&B credit per stays. Both offers are valid for stays that are both booked and consumed between April 15 – June 15, 2017. You can access the “We Miss You” offer here and the $20 F&B credit offer here. Note that both of these offers are valid for Le Club AccorHotels members that have their account address in any of the participating countries ( Cambodia, Laos, Indonesia, Malaysia, Myanmar, Philippines, Singapore, Thailand and Vietnam). You need to book this specific We Miss You-rate to get the discount voucher that is valid at participating restaurants. You need to book this specific rate plan to be eligible for the one-time F&B credit. You need to check the rates that the hotels are offering and then decide if it is worth paying a premium for the extra benefits or the discount voucher. 1. General Le Club AccorHotels terms and conditions apply to the “We Miss You” offer and you must be a Le Club AccorHotels member to benefit from it. 2. This offer entitles Le Club AccorHotels members, classic status who receive this specific email communications from Le Club AccorHotels team, book and stay on “We Miss You” rates to get an “Accor Plus Member-For-A-Stay” letter for each stay to enjoy the special dining benefits in the participating restaurants in the offer. Please see hotel list here goo.gl/q9G3KZ and please check restaurant participation with the hotel directly. The discount is up to 50% during entire stay; come 2 get 50%, come 3 get 33%, come 4 get 25%, come 5 get 20%, come 6 get 15%, come 7 or more get 10%. 3. The “Accor Plus Member for a Stay” is only valid during your stay, with date mentioned on the letter, to enjoy the dining benefits at the participating hotel’s restaurant. Once you booked this offer, you are agreed to share your contact details with Accor Plus team. 4. This offer is valid for a member’s stay from 15 April 2017 to 15 June 2017 in one of the participating hotels in Cambodia, Laos, Myanmar, Indonesia, Philippines, Singapore, Thailand, Vietnam and booked between 15 April 2017 to 15 June 2017. 5. The stay must consist of a minimum of 1 night. 6. Any consecutive stays (check-out and check-in on the same day) at the same hotel will be considered as a single stay. Such a single stay can only benefit once from “We Miss You” offer. 8. To benefit from this offer, your booking must be made on the offer rate name “We Miss You” via AccorHotels.com, our participating brands web sites and applications and via AccorHotels Call Centers. All other reservation channels will not be eligible to this offer. 12. Please specify the reference ID49421 in all your communications with AccorHotels call centers or customers care services related to this offer. 1. General Le Club AccorHotels terms and conditions apply to the “Come Back For More” offer and you must be a Le Club AccorHotels member to benefit from it. 2. 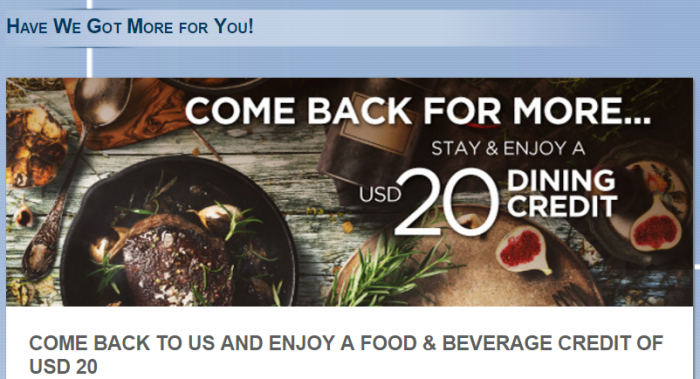 This offer entitles Le Club AccorHotels members who receive this specific email communications from Le Club AccorHotels, to book and stay on “Come Back For More” rates to get a “USD 20 dining credit”. This dining offer can then be used as a credit to pay for your food and beverage during your stay in the participating restaurants in the offer in participating hotels. This promotion is not applicable for partner hotels of Le Club AccorHotels. 3. The “USD 20 dining credit” is only valid during your stay. The credit cannot be exchanged for cash, and is not transferable. 4. This offer is valid for a member’s stay from 15 April 2017 to 15 June 2017 in one of the participating hotels in Cambodia, Laos, Malaysia, Myanmar, Philippines, Thailand and Vietnam and booked between 15 April 2017 to 15 June 2017. 6. Any consecutive stays (check-out and check-in on the same day) at the same hotel will be considered as a single stay. Such a single stay can only benefit once from “Back For More” offer. 8. To benefit from this offer, your booking must be made on the offer rate name “Come Back For More” via AccorHotels.com, our participating brands web sites and applications and via AccorHotels Call Centers. All other reservation channels will not be eligible to this offer. 12. Please specify the reference 49423 in all your communications with AccorHotels call centers or customers care services related to this offer.